We will begin at the front of the park inside Los Festivales where one food stand is serving up some fantastic dessert items. Mockingbird Funnel Cakes is offering up a large number of specialty funnel cake options during Holiday in the Park. Please note that the items listed below do require an additional charge when using a Dining Pass. Soon after coming through the entrance of the park in Los Festivales, head to the right into Crackaxle Canyon as there are three different restaurants serving up great holiday food options. The first location you’ll run into is Old Blue’s BBQ. 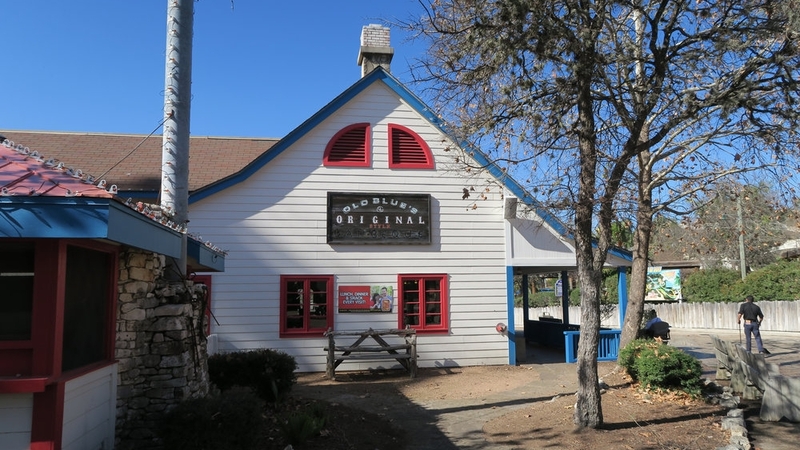 Old Blue’s BBQ has a solid selection of meal options found on the Dining Pass. The restaurant also has a great amount of indoor and outdoor seating available. Totally Kickin’ Chicken is your next stop in Crackaxle Canyon and is located across from Road Runner Express. They have a specialty snack option available here. Some outdoor seating can also be found at this food stand. Bubba’s River Cafe is the final stop in Crackaxle Canyon. This restaurant, equipped with indoor seating, outdoor seating, and a special Diamond/Diamond Elite seating area, has two unique food options during the event. After leaving Crackaxle Canyon you will head directly into the Spassburg section of Fiesta Texas. Sangerfest Halle, the park’s largest indoor restaurant, serves a larger line-up of both meal and snack options. Guests eating inside Sangerfest Halle can also enjoy the Have Yourself a Looney Tunes Christmas show that plays up until December 23rd. Show times can be found on our Live Shows page. The Rockville area is your final destination to find specialty holiday foods. There are two restaurant locations in this park area that are offering unique options during Holiday in the Park. Funnel-Liscious is a mecca for all things fried and delicious during Holiday in the Park. While funnel cakes are still available, the park has upped the offerings this season and they are all on the Dining Pass as a snack. 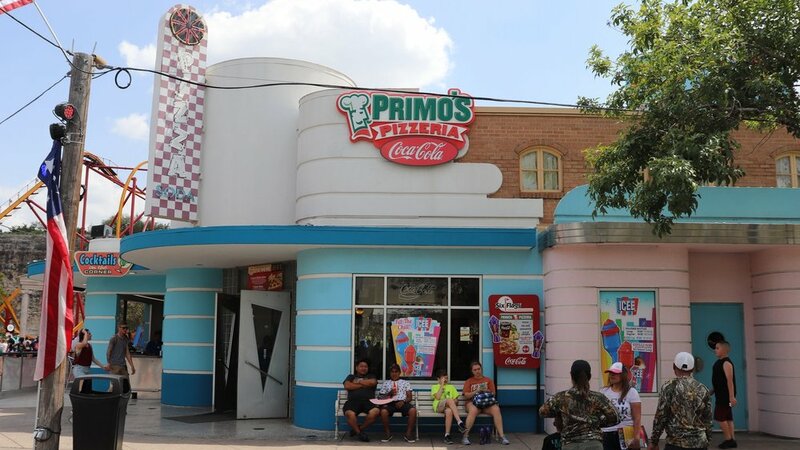 Primo’s Pizzeria is the final stop on our specialty food tour around Fiesta Texas. This indoor restaurant features two quite unique options on top of their regular Italian menu. Still looking for even more information about Holiday in the Park? Head over to our comprehensive 2018 guide for more information. You’ll find an interactive attractions map, full line-ups of entertainment, and even information regarding holiday activities. Our guide also provides Holiday in the Park-related media and show times for the park’s award-winning entertainment. Click the button below for more. Have more questions about Holiday in the Park? Ask in the comment section below!